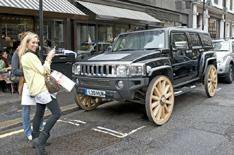 Hummer gets wagon wheels | What Car? Don't worry, these wagon wheels aren't the latest must-have accessory that Hummer is offering to show off its all-American, Wild West credentials. This Hummer is a one-off sculpture by artist Matthew Harrison for the Zoo Art Fair, which opens in London tomorrow. The piece is called 'Hummer' and will be parked on Old Burlington Road for the duration of the show (17 - 20 October). Reports of a Volvo truck on skis, and a Fiat 500 on Milan-designed stilettos are completely false.